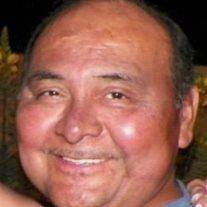 Daniel Martinez peacefully passed away on May 16, 2014. He was born September 14, 1952, to Pedro Candido and Adelaide E. Martinez, the youngest of 8 children. Daniel graduated from Westwood High School in 1971 and married his high school sweetheart, Barbara J. Martinez. They were sealed in the Mesa Arizona Temple in 1993. They raised 4 sons, Mark (Julie), Jr. (Laura), Jim (Wendy), and Mikel. He is survived by his wife, sons, 10 grandchildren, and 7 siblings. Funeral services will be Friday, May 23, 2014 at 10 AM at the Kimball Stake Center, 1266 S. 32nd St., Mesa, AZ, preceded by a visitation from 8-10 AM at the same location. Arrangements by Bunker’s Garden Chapel.